A Droitwich-based recycling and waste management firm is investing in its fleet with funding support from Lloyds Bank Commercial Banking. Clearaway, established in 2013, provides recycling and waste collection services to a range of businesses in Worcestershire and the West Midlands including schools, manufacturers and retailers. The company currently performs approximately 250,000 collections every year. Due to an increased demand for its services, it recently turned to Lloyds Bank for funding support to buy an additional waste collection vehicle. A £110,000 hire purchase facility from the bank allowed Clearaway to spread payments over an agreed term for the new vehicle, which will allow the business to carry out 30 more collections every week and expand its customer base. An additional £250,000 funding from the bank will also be provided later this year to fund the purchase of two more vehicles in early 2018, as part of the company’s plans to replace its existing fleet with new, low pollution models that are more fuel efficient. 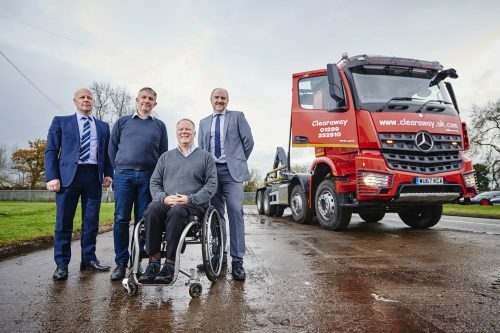 Andrew Gibson, Director at Clearaway, said: “The investment in our fleet will help us to accelerate our growth over the coming months and years, as well as become more sustainable with fuel-efficient vehicles that cause less pollution. Ian Littleford, Regional Manager at Lloyds Bank Commercial Finance, said: “It’s great to see Clearaway flying the flag for Worcestershire and investing in its growth, despite these uncertain times.